Yang Yongliang, “The Path” from the series salt 14: Yang Yongliang 2016. As a traveler enters the salt 14 exhibit to see Yang Yongliang’s landscape photography, they may feel a sense of familiarity at first glance, though they will be unsure why. None of the landscapes could possibly bear any familiarity to anyone except the most seasoned traveler, and only once they stand and closely examine the scenes will they realize that every piece of this landscape is constructed from crumbs of cliffs and cities they could have seen before, either through travel or reproduction. What they now see is a vast composite of photographs from across Shanghai and the rest of Asia, now made into new and familiar landscapes. The Utah Museum of Fine Arts exhibition, fully titled salt 14: Yang Yongliang, is a series of six internally lit landscape photographs and one huge 4K video. Seeing it is like a visualization of a city from Italo Calvino’s Invisible Cities (Le città invisibili). In the novel, Marco Polo spends a lazy evening smoking with Kublai Khan, describing to him the cities of his vast empire—but these cities exist on no real map. Invisible Cities is a fictitious travelogue that acts as a meditation on culture, infrastructure and the livelihood of cities rather than it does a literal mapping. In fact, Polo’s tales are often metaphor or parable accounts—the citizens of Ersilia, for instance, stretch strings from corners of houses to mark relationships. Those who arrive at Thekla see little past its constant construction and scaffolding. These cities are imbued with ideas and ruminations on existence. 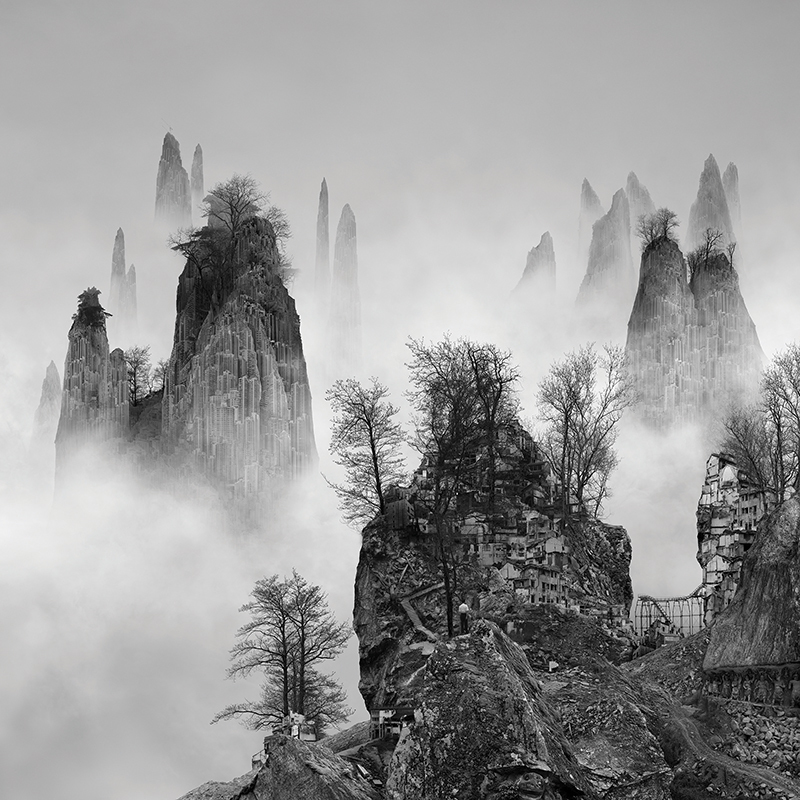 Yongliang’s landscapes mirror this effect by disrupting our expectations, playing with what constitutes “natural” landscapes and habitable structures, conflating the two beyond what any real city demands of our perception into a terrifying vision of civilization. The smaller lightbox examples of this aren’t always comprehensive of this comparison but still recall it. “Lone House” is a good example of the collision between familiarity and rumination, though it’s the least city-like. A river separates a foregrounded two-story house and phone lines from a background of jagged hills made of favela-like slums, homes constructed on top of and through each other. The composition is eerie as the housing blends into the landscape seamlessly—the two worlds existing simultaneously, opposed. I like to imagine myself on one bank or another, considering life on the opposite side. More curious is “The Cliff.” The landscape that foregrounds feels natural and comfortable, but the background calls to mind the sorts of images Invisible Cities conjures: rock cliffs constructed entirely of skyscrapers adorned with trees, waterfalls and cranes. The backlight dares you to stare more closely—are those rocks or buildings? Do these landscapes even fit? What’s behind the fog? The backlit format is a compelling way to bring out the complexity of an image, each of which deepens as you look at it, feeling more and more intricate. As I began to see the landscape for what it is (colonized, industrialized, integrated), I vacillated between feeling calm and frustrated. As an image, it has a constructed sense of beauty; as a potential reality, it forebodes dread. To imagine any of these landscapes as real is deeply unsettling. I hesitate to call these landscapes entirely dystopic. Some achieve a tense unity between land and man. “The Streams” approaches a notion of what an equitable collage between man and nature might feel like, though I suspect that this is because of the way water flows through the city and landscape. To call it a trick feels cheap, but to call it cathartic feels dishonest. Skyscrapers still dominate the background; antennas loom in the distance. By far, the most alluring piece is the 4K display showing “Prevailing Winds,” Yongliang’s mangum opus in this exhibition. While it mostly functions as a larger, crisper version of its smaller lightbox counterparts, “Winds” is truly arresting. The piece features a huge island of interconnected roads, cliffs and boats that reads like an infinite game of “I spy.” The landscape remains static while individual components of the foreground buzz with movement: Waterfalls, cars and cranes all move to create a living, ethereal image. Roads wind and disappear into themselves, cranes oscillate endlessly, and antennas top mountains as second-glance trees. The screen vibrates like an ant colony. I suggest getting as close as possible and swallowing this image fully. But what’s most disturbing? All of this exists somewhere. These aren’t composites of nothing. 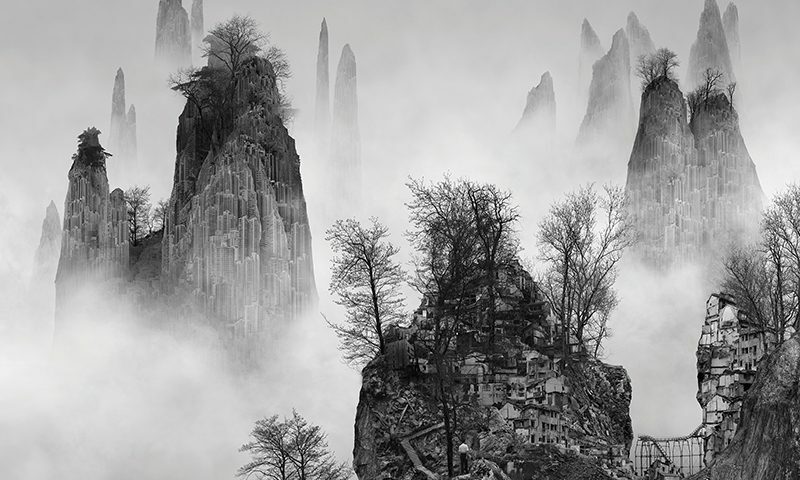 All the source material Yongliang uses to imitate the repeating mountains and buildings exists someplace, and while it seems to repeat at times in Yongliang’s work, it doesn’t diminish the effect of seeing it multiplied, stacked and modified into a single landscape. The longer it plays, Prevailing Winds feels like a grim future, a miscalculated blend of urban sprawl into a pliant nature. Toward the end of Invisible Cities, Marco Polo describes to Khan the city of Perinthia, a city established by astronomers according to the stars. Constructed precisely and intently, the city eventually falls to disease, and Perinthia’s astronomers must either admit that their calculations were wrong and unable to describe the heavens—or else they must reveal that the order of the gods is reflected exactly. This is the anxiety I feel most often in Yongliang’s work: that even our best, most guided efforts undo us.